Back in March I was able to travel to Greece and Turkey with my brother. This is the last leg of the journey. I have enjoyed sharing thoughts and images from a wonderful trip! For a preview of the trip, read the A Guide to Biblical Sites in Greece and Turkey entry and read my thoughts on Athens, Corinth, Ephesus, and Cappadocia. The drive back to Kayseri was much more revealing in the daylight. The snow-capped Mount Erciyes was in clear view and served as a nice backdrop to our departure to Istanbul. It was during the flight that we realized we were flying into the airport on the Asian side of the city, which is farther out than the airport on the European side. For a couple liras we took an hour bus ride to Taksim Square, and then a taxi to our hotel. Our hotel was located close to the historic Sultanahmet district and many of the main sites in Istanbul. So after settling in our room we set off orienting ourselves to the city. Hiking through the desolate landscape of Cappadocia was quite the contrast to hiking the urban streets of one of the largest cities in the world, yet there are many similarities as well. We had arrived in Istanbul early enough to have most of our afternoon and evening to explore the city. We strolled through the Spice Market and the surrounding Egyptian Market. We soon learned that Istanbul is like one giant Target store: If you found the right aisle, or in this case several city blocks, you could find anything you were in need of. We wandered through the clothing district, the spice market, electronics, hardware supplies on several city blocks, food courts, the jewelry district, and even art and music supplies. If you found one music store, you would surely find several others down the same block. It was fascinating to just wander. By evening, we found some of the primary sites of Istanbul. The Blue Mosque was built in 1609, meaning it was relatively new as far as the architecture of the city goes. It is an impressive structure. It is located at the site of the great Hippodrome that hosted most of the sporting events in Constantinople for over a thousand years. The area is now a park, but is still home to two or three of the monuments that would have been part of the stadium. 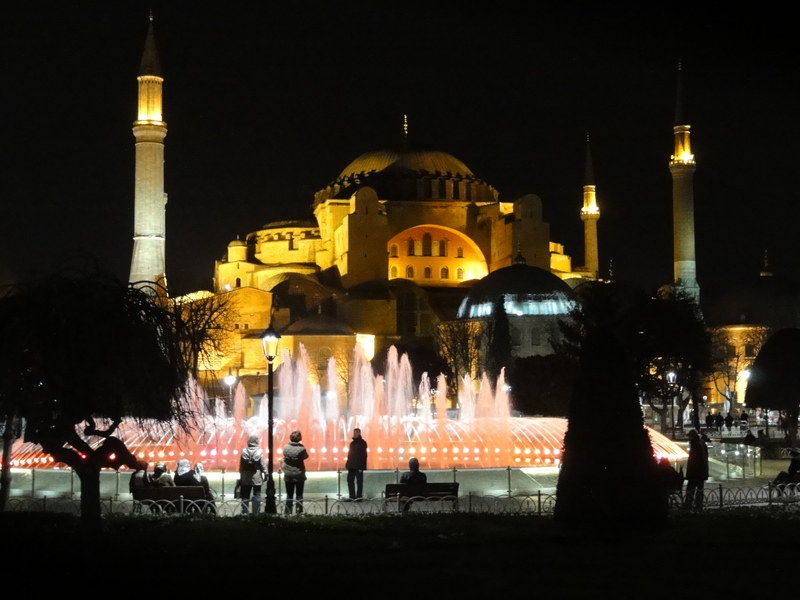 Facing the Blue Mosque is the Hagia Sophia, the primary church of the Byzantine Empire. We located the Basilica Cistern nearby and managed to get in just before closing. The cistern served as one of Constantinople’s main water supplies and has the capacity to store 100,000 tons of water. The next day we returned to the Hagia Sophia, as it was closed the previous evening. It is an incredible space filled with Christian mosaics and Islamic calligraphy. It is odd to see both side by side, but because it served as a church for the Byzantines and then was converted to a mosque when the Byzantine Empire fell in 1453, it is now a museum where both histories reside together. Unfortunately, Turkish courts have just ruled that it could be converted back into a mosque, bringing into question the fate of much of the Christian artwork. After a boat ride on the Bosphorus, we made our way up to the Galata Tower, which is a great place to take in the entire panorama of the city and watch the sunset. We ended up back near the fish market on the shore of the Bosphorus, where we enjoyed a wonderful grilled fish sandwich while taking in the evening boat traffic and listening to the evening call to prayer. It was one of those perfect simple moments that cannot be scripted. On Thursday, we took the train out to the old city walls, sometimes known as the Theodosian Walls. Built in the 5th Century, they protected Constantinople for a thousand years. Large sections of the wall still remain. We took it easy the rest of the day as we had been going non-stop for most of the trip. So the remainder of the day was spend walking the city, enjoying coffee, and perusing the markets. The last day turned cold and rainy, so we stuck to indoor activities. 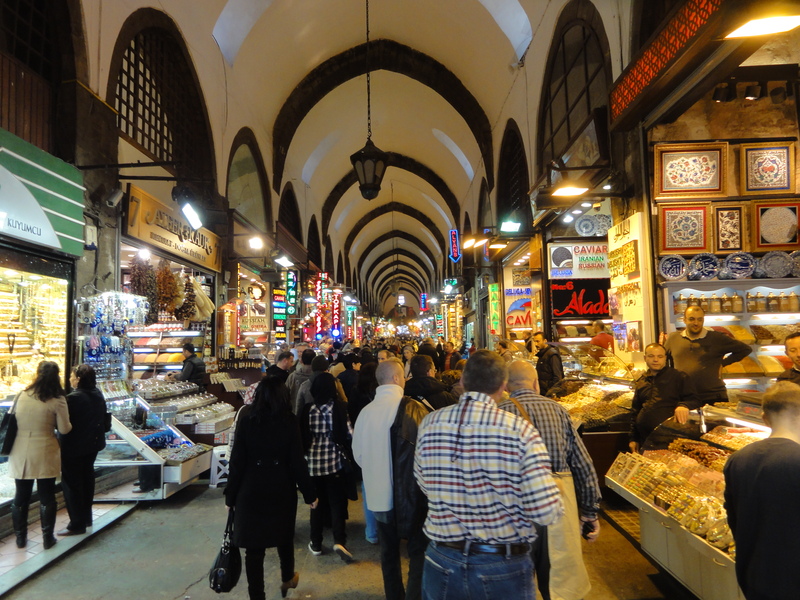 We went to the Grand Bazaar, which wasn’t quite as grand, having walked through many markets already. Then we took in the Istanbul Archaeological Museum, home to numerous artifacts from Turkey’s long history. Still raining, we spent the evening in a coffee shop processing all we had taken in over the course of the trip. The next day we would be heading home. 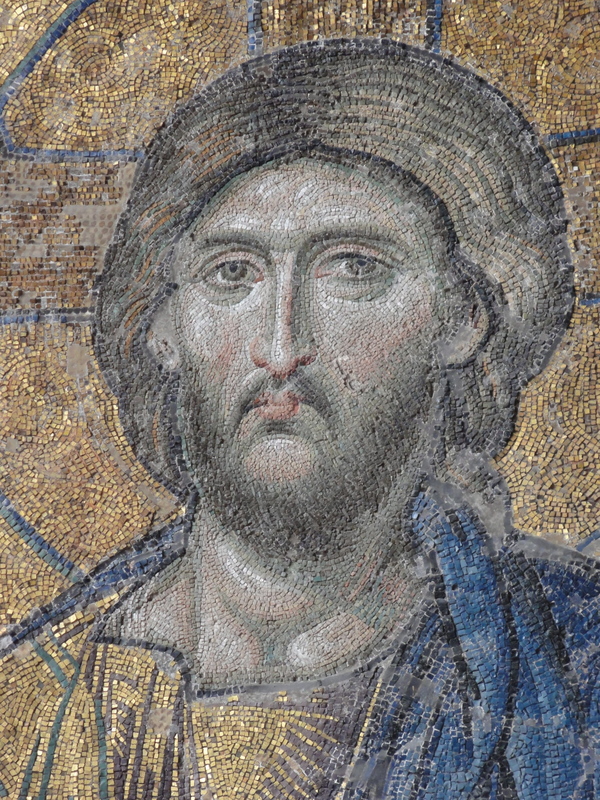 Insight #1 – Constantinople preserved a wealth of Christian history, while elsewhere it was crumbling. When the Emperor Constantine moved the capital of the Roman Empire from Rome to what would become Constantinople, one could argue that he extended the Roman Empire by an additional thousand years. While one can also argue whether it was a good thing for Christianity to be subsequently aligned with the new Roman Empire in Constantinople, much of its history was shaped and preserved as Constantinople flourished. Meanwhile, the city of Rome fell into decline and the Western Empire would come to an end in 476. Over the next several hundred years, Constantinople became an immovable object against the surging tide of Islam. Historians have pointed out that were it not for the strength of Constantinople strategically located between Europe and Asia, Islam could have become the dominant force throughout Europe. Insight #2 – Faith is not housed in buildings. As impressive as the Hagia Sophia was, it was not the dwelling place of God and faith. Seeing the Hagia Sophia (and many churches throughout the Middle East as well) converted into a mosque, then a museum, and now potentially a mosque again, it is a reminder that God does not live in structures we build. As I mentioned in my Athens post, Paul would point out that, “God does not live in your magnificent temples.” Buildings can be impressive and communicate much about God, but God resides among people. The modern church can learn from this as well. Insight #3 – Disagree with ideas and beliefs, but don’t destroy history. While structures do not contain faith, something is lost when structures are destroyed over faith. It was a common theme to hear throughout the trip: An impressive piece of history was lost when one group destroyed it during a conflict. Christians tore down temples, pagans destroyed churches, churches were converted to mosques and then back again, libraries were burned – there are so many stories like these. From a historical perspective it hardly seems worth destroying so much history. Argue, disagree, fight if you must, but leave art, books, structures, and monuments alone! There is so much to be learned from these things. Thanks for following along. Even if very few read it all in its entirety, I enjoyed reliving it! It’s been a busy week, but I want to continue processing my trip and share some stories from each place. Back in March I was able to travel to Greece and Turkey with my brother. For a preview of the trip, read the A Guide to Biblical Sites in Greece and Turkey entry and read my thoughts on Athens, Corinth, and Ephesus. 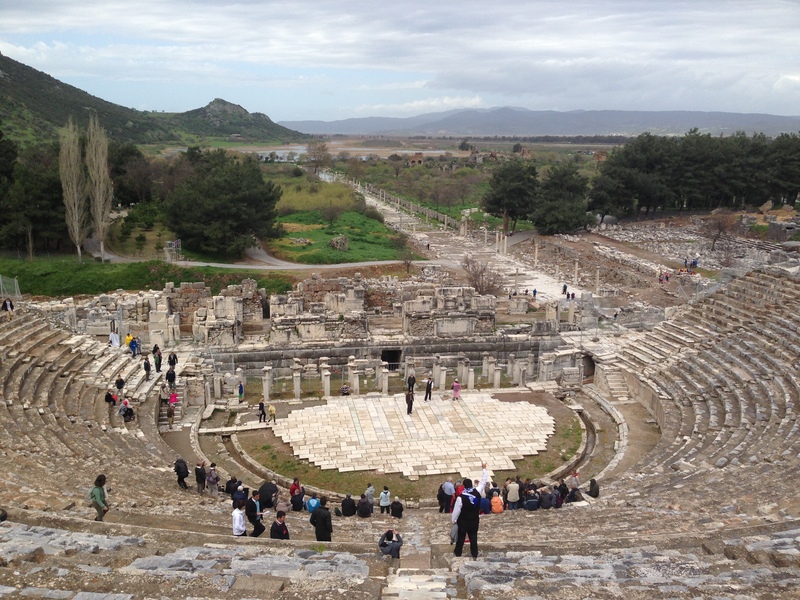 Our time in Ephesus was followed by a travel day. Trains, planes, and automobiles! We took the train back to Izmir, where we caught a flight to Istanbul, then a connecting flight to Kayseri in central Turkey. By the time we got to Kayseri it was dark, which was disappointing because we knew the landscape was supposed to be spectacular. Indeed, we didn’t even realize until our return that Kayseri sits at the base of one of the largest mountains in Turkey! 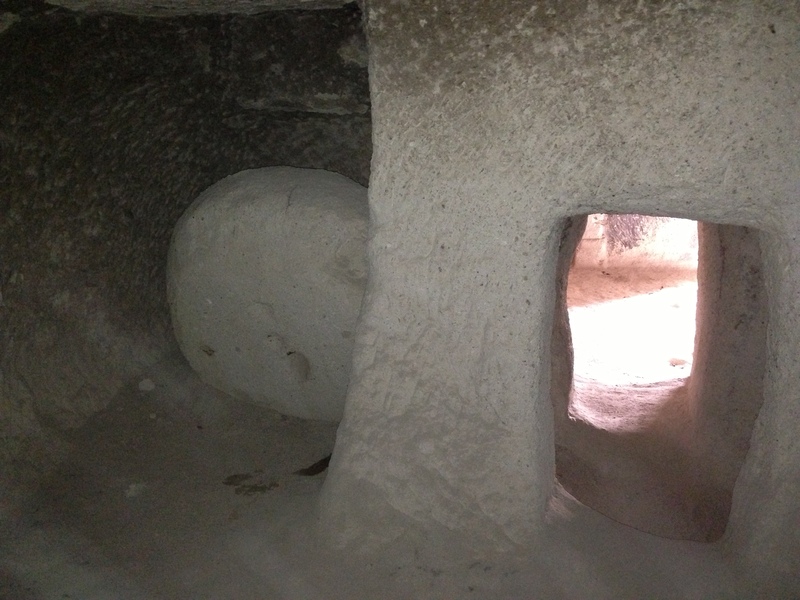 A car picked us up from the airport and took us to the town of Göreme. When we finally arrived in Göreme we could begin to make out the strange formations Cappadocia is known for. The landscape in Cappadocia has been strangely shaped by volcanic activity from times past, along with erosion over time from water. The rock in the area is almost chalk-like – easy to chip away and carve. The result is an area with deep ravines surrounded by tall cone-shaped rock structures, sometimes called fairy chimneys. 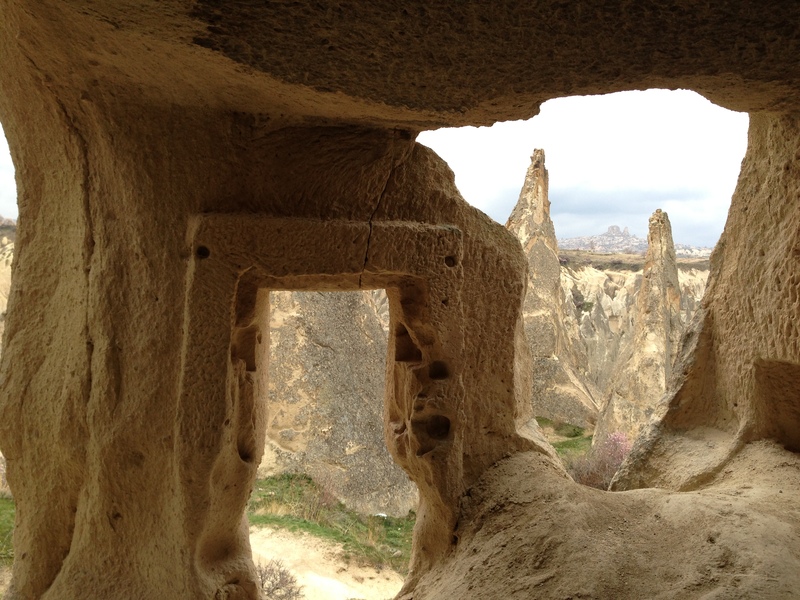 People have carved dwellings in these formations for thousands of years. In keeping with that tradition, in the town of Göreme visitors can stay in hotels carved right out of the rock formations. It’s one of those things you have to do to at least say you did it: stay in a cave hotel in Cappadocia. Our room was spacious and comfortable with a modern bathroom. Yet all the décor, save two chairs and a table, were carved right out of the rock. It wasn’t until breakfast the next morning that we were fully able to take in the other-worldly landscape at which we had arrived. The snow flurries in the air only made it that much more enchanted. Our first stop was the Göreme Open Air Museum. The museum is a small area of these chimney formations with numerous churches and monasteries dating back to 1100 AD. Many of these structures have multiple levels connected by stairs or tunnels carved through the rock. Because they are protected from the elements, many of the churches are still beautifully painted with images from the Bible. It was easy to see how these paintings were used as a way of communicating the important narratives of the New Testament. The entire museum area is surrounded by Göreme National Park and upon leaving the museum, we realized the entire park is, in essence, a giant museum. I had read that it was relatively easy to set off hiking in a given direction and as long as you could keep the town of Göreme in sight from the higher vantage points, you would not get lost. So we set out to test that theory! Amidst snow flurries, we spent the day hiking, climbing up to openings in the rock, exploring cave houses and churches, and belly crawling through small tunnels, unknown as to where they might lead. My brother described the area as a giant playground for adults! Every so often, we would see a hiker or two off in the distance, but other than that we had the place to ourselves. 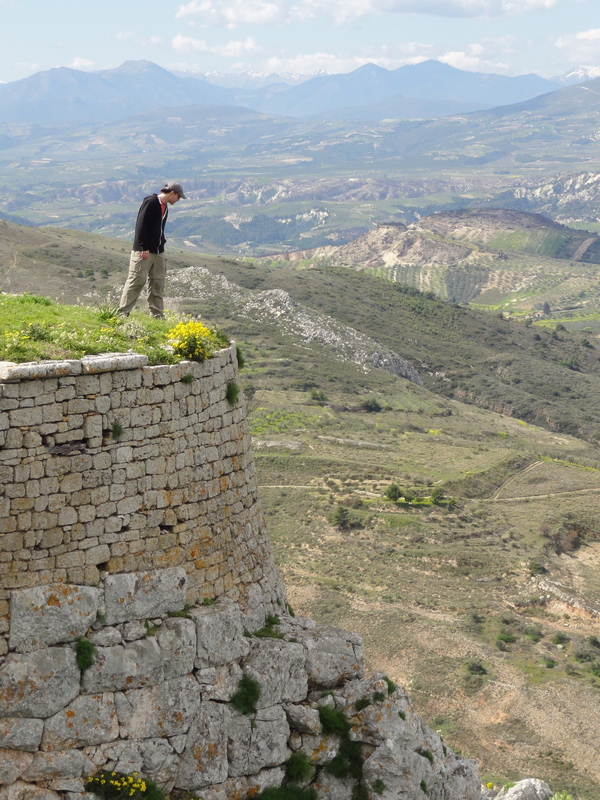 Later in the afternoon we climbed to the top of a ridge to locate the town off in the distance. Not wanting to backtrack, we followed the ridgeline, hoping to find a safe place to descend down to the valley floor and make our way toward town. 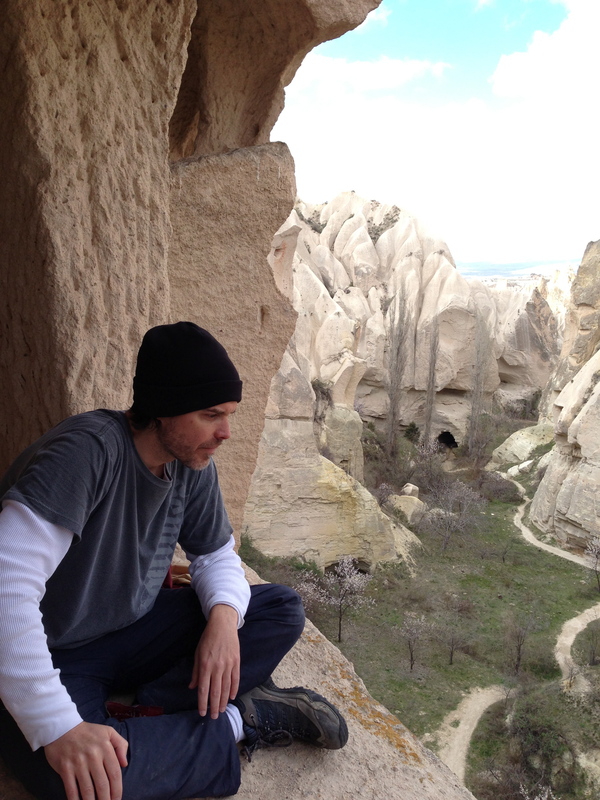 It took longer than anticipated, but we finally located a way back down, found the main road, and headed back into Göreme. The town of Göreme itself reminds me of a ski resort town. Hotels encircle a main strip full of restaurants, shops, and a river running straight through town. We were cold and exhausted and found the perfect coffee shop in the middle of town to warm up in and process the day. Later we went looking for a place to eat. Warning: do not stop to look at menus unless you are ready for the full sales pitch, or are very quick about it! We did get quite the sales pitch at one place and the meal was wonderful – lamb cooked in clay pots, bread with assorted dipping sauces, and Turkish baklava. We ate like kings! My brother and I agreed that it was perhaps one of the better days of our lives. The next day we considered a couple side trips/activities, but decided on more of the same: this time hiking the Rose Valley trail through the park. We began by running across a cave church structure, complete with a dining hall, dovecotes, a wine press, and a bee farm to harvest honey. For lunch we climbed up to a platform that used to be a dwelling of some type and overlooked the ravine below. When we were about spent at day’s end, we ran across a couple other hikers who told us of a large church just up the trail that was worth the climb. We found the opening in the rock face and climbed up to a second level to find ourselves in a sanctuary as large as a decent-sized church building today. Again, none of this is visible from the outside. It was a nice way to end our hike. We ended up in an adjacent village and found someone happy to drive us back to Göreme for some gas money. What a truly magical place! Insight #1 – Cappadocia isn’t mentioned often in the Bible, but it is mentioned. In Acts 2, Cappadocia was listed as one of the places/languages people were able to hear being spoken when the Spirit fell on the believers in Jerusalem. Later, the beginning of 1 Peter is addressed to Christian exiles scattered throughout what is now Turkey, with Cappadocia being listed among the regions. These few references tell us that it was home to a Jewish population and subsequently a Christian population as well. Paul traveled to the south of Cappadocia in order to focus on the prominent cities of Asia Minor, such as Ephesus. But little doubt the message eventually spread north and east to Cappadocia. Insight #2 – Although it didn’t play a prominent role in the New Testament, Cappadocia would help shape the church for the next several hundred years. 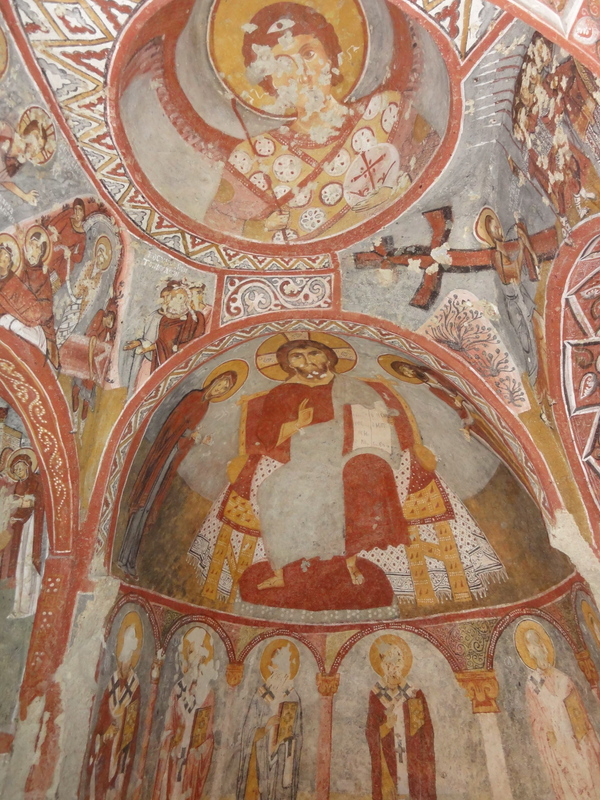 We know the message spread to Cappadocia because several figures in the early church came from Cappadocia, including Basil the Great and Gregory of Nyssa. These leaders were instrumental in shaping the monastic movement in Christianity. Monasticism was active in the region for the next thousand years. Examples of cave monasteries abound in the region. Insight #3 – Cave living. Having explored the area for a couple days, I am convinced that cave living would have been pretty comfortable for that time. Like I mentioned above, it was flurrying the first day we hiked through the park. But once in the caves, we could take our winter wear off and be fine – not to mention that we didn’t even have a fire going. The carved out dwellings would have stayed cool in the summer and moderate in the winter. There were places to raise bees for honey, wine presses, dovecotes, and stables for horses. Most importantly, they were easily defended and safe from the elements, with passageways that could be sealed off if trouble arose. There are many accounts of enemy armies being unable to even locate these cave cities because the residents would simply disappear into the hills or underground. The last stop is Istanbul! 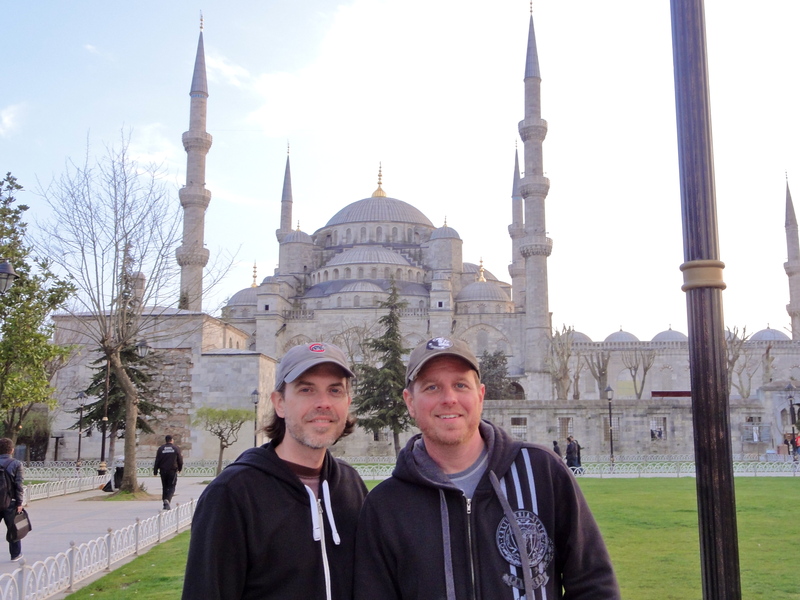 In March I was able to travel to Greece and Turkey with my brother. I am continuing to process each place we visited, share some of our adventures, and take what I can from having been there. For a preview of the trip, read the A Guide to Biblical Sites in Greece and Turkey entry and read my thoughts on Athens and Corinth. After spending about four days in Greece, we hopped a plane to Istanbul, Turkey and caught a connecting flight to Izmir. From the Izmir airport, we took a train about an hour south to the town of Selçuk. Unfortunately, the sun had already set, so there was not much to see. Arriving in Selçuk, we found our hotel and were warmly greeted with some tea and good conversation with a man named Lucky. I liked this place already! Selçuk is a nice little town where shop owners want to sit and talk with you. There are good places to eat, coffee shops, and sweet shops as well. Right outside of the town, sits the site of Ephesus. Many tourists come from the cruise ship port not far from Ephesus, but increasingly travelers are discovering that Selçuk is a great place to spend a couple of days away from the tourist town of Kusadasi. Neither my brother or I are big on guided tours – they are always moving you on to the next stop before having adequate time to explore the present stop and the lunch buffets are usually pretty bad – but about the only way to see the ancient sites of Priene, Miletus, and Didyma was via guided tour. 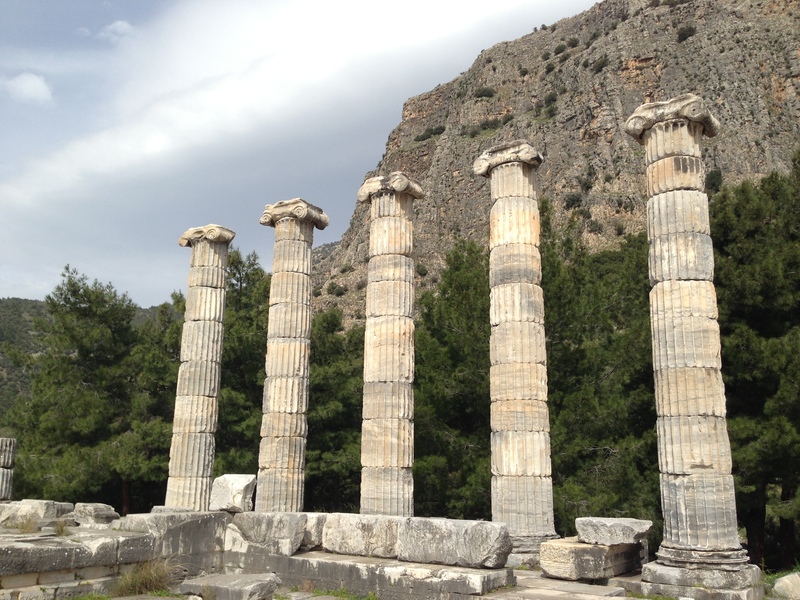 Priene is the home to the Temple of Athena, which rests at the base of an imposing cliff face. The site was abandoned when the shoreline receded. The remote nature of the site means that much of the building material is still there, resembling a jigsaw puzzle dumped out over the site. It is not mentioned in Scripture, but its proximity to Miletus suggests that the early church nearby would have had contact with Priene. Across what used to be a bay, sits the site of Miletus. Miletus boasted three harbors in its day, along with a 25,000 seat amphitheater, much of which is still intact. The rest of the site was unfortunately flooded for the most part, but a large Roman bath complex is still there. It must have been impressive in its day. Miletus is mentioned in Acts 20: On Paul’s Third Journey, he sailed into Miletus where he met the elders from Ephesus, wanting to avoid getting delayed on his way to Jerusalem. Today Miletus is about five miles inland from the coast and suffered the same fate as Ephesus and Priene when the river silted up, cutting the city off from the coastline. The final stop of the day was Didyma, which wasn’t so much a town in Paul’s day as it was a temple complex to Apollo. Today it is odd to see a town built up around the site, with kids and dogs running around and ruins lying in people’s backyards. The Temple of Apollo was the third largest Greek temple of its time and would provide some perspective to the Temple of Artemis at Ephesus, given that little remains of what would have been the largest temple. Walking among the ruins, we felt like we were on a movie set constructed for giants. Didyma was linked to Miletus via a 12-mile sacred processional way. The next day we walked through the site of Ephesus. Having walked through many archaeological sites at this point, the prominent feature of Ephesus is just how large an area the site is. From the upper entrance, you can walk through a marketplace, small temples, archways, an Odeon, only to realize you have not yet reached the main road through the city. Curetes street leads you past several structures to the terrace houses (which are worth the extra admission price) and finally leaves you facing the Library of Celsus. The main agora itself covers the area of two football fields, then you are awed at the 25,000-seat theater. The theater overlooks Harbor Street that would have led to the docks. There are many areas that remain unexcavated or have not been kept up. Ephesus had a population of 250,000, by some accounts the third largest city in the Roman Empire behind Rome and Alexandria. Walking through the city, the surrounding hills – now just grassy hillsides – must have been covered with houses and shops. Paul had truly entered the big city! And you still would not have come upon the primary identity of the city: the Temple of Artemis, the largest temple in the empire. We made our way through an orchard back to the main road and found the site of the temple. There is little that remains, only its enormous footprint in the earth and a single reconstructed column. 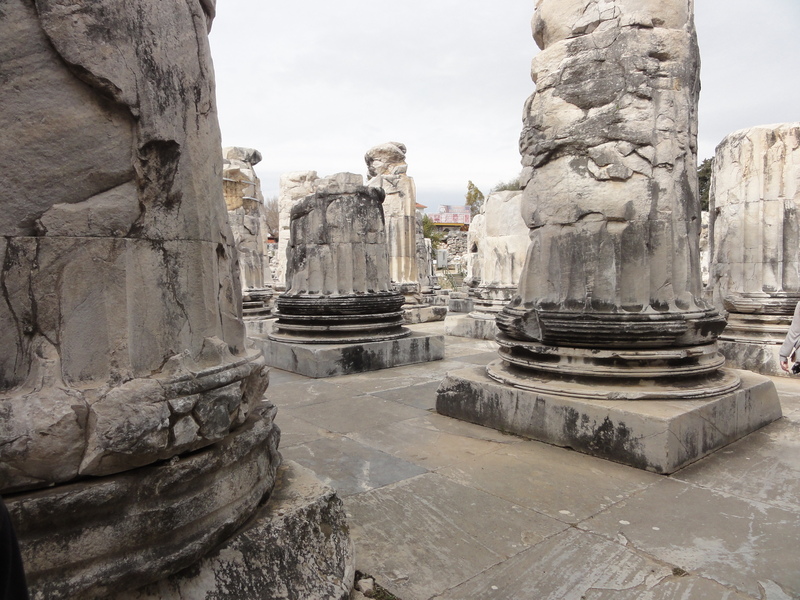 I am glad we were able to visit Didyma to appreciate what it must have looked like. 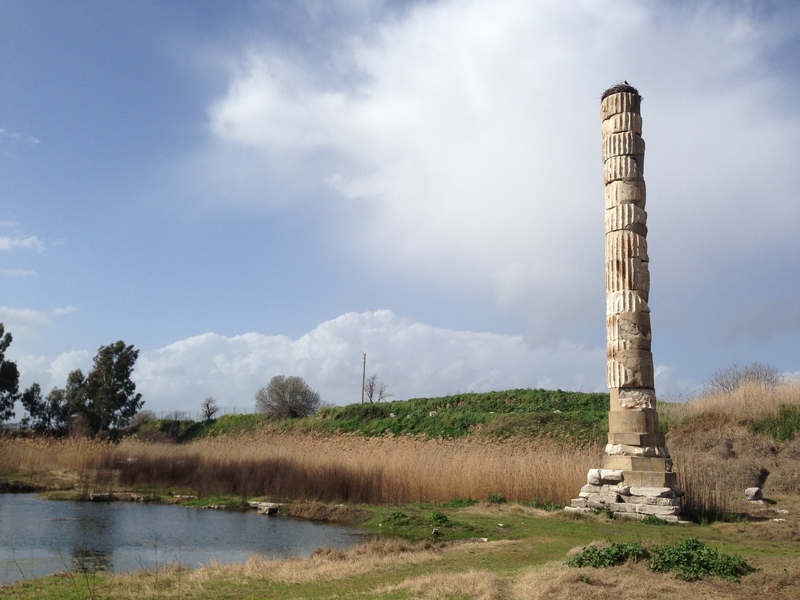 Insight #2 – The Temple of Artemis and its influence on Ephesus. It is difficult to overstate how much the identity of Ephesus was inextricably tied to the Temple of Artemis. It was one of the Seven Wonders of the Ancient World for a reason. Jerome Murphy-O’Connor notes that, “Artemis was part of the fabric of Ephesus, and the city was unthinkable without her. Ministry in Ephesus, Paul mused, was going to be very different.” In Athens when Paul announced that God does not live in your magnificent temples, the philosophers perhaps raised an eyebrow. In Ephesus, that sentiment morphed its citizens into a violent mob. This led to the uproar in the Great Theater. Insight #3 – The scene at the Great Theater. The Temple of Artemis contributed greatly to the economy of Ephesus. Just as a modern-day sports team would draw fans throughout the region on game day contributing to the local economy, Artemis drew pilgrims from the region on a continual basis. An entire industry sprang up around the production of small shrines of the temple and Artemis (available in the gift shop, no doubt) of which several have been unearthed in the region. So Paul’s message was not just perceived as a religious threat to paganism, but also an economic threat to the livelihood of the city. We do not want you to be uninformed, brothers and sisters, about the hardships we suffered in the province of Asia. We were under great pressure, far beyond our ability to endure, so that we despaired of life itself. Indeed, we felt we had received the sentence of death. There is little doubt that seeing his colleagues being dragged into the Great Theater and he, himself being threatened, this event left an indelible mark on Paul’s psyche. There is much more that could be said about Ephesus. In fact, my next project is exploring these very themes in the letter of Ephesians. But this will suffice for a trip update. Last month I was able to travel to Greece and Turkey with my brother. I wanted to share my experience in each city, as well as some insights gained. For a preview of the trip, read the A Guide to Biblical Sites in Greece and Turkey entry and read my thoughts on Athens. The Biblical city of Corinth is about an hour train ride from Athens, though for the Apostle Paul it may have been 2 or 3 days journey. From the train station, we took a taxi to the Acrocorinth. The Acrocorinth is an 1,800 ft. high natural rock fortress that serves as the backdrop to many photos of the ancient city. It strategically oversees the narrow strip of land that separates the Peloponnesian Peninsula from mainland Greece, and thus gave Corinth an elevated military and economic status. Oddly, most tourists skip the Acrocorinth and head straight for the ancient city. This is a mistake! I had read that we were likely to have the walled fortress to ourselves and that was indeed the case. We spent a good hour (and could have spent more) exploring the citadel’s three gates that offered the only access to the top, the mostly intact walls encircling the summit, and various structures representing different eras of occupation over the past 2,500 years. In the middle of an overgrown patch of ground at the top, one can see the foundation of a temple to Aphrodite. Strabo wrote that this temple was once home to a thousand temple prostitutes. More on this below, but it is difficult to capture the full impact of Corinth if you skip the Acrocorinth. After overcoming a small language barrier (tip: when the taxi driver quotes you 15 Euro to shuttle you around Corinth, it is best to confirm in writing that he is not actually quoting you 50 Euro) we were dropped at the site of the city of Paul’s day. 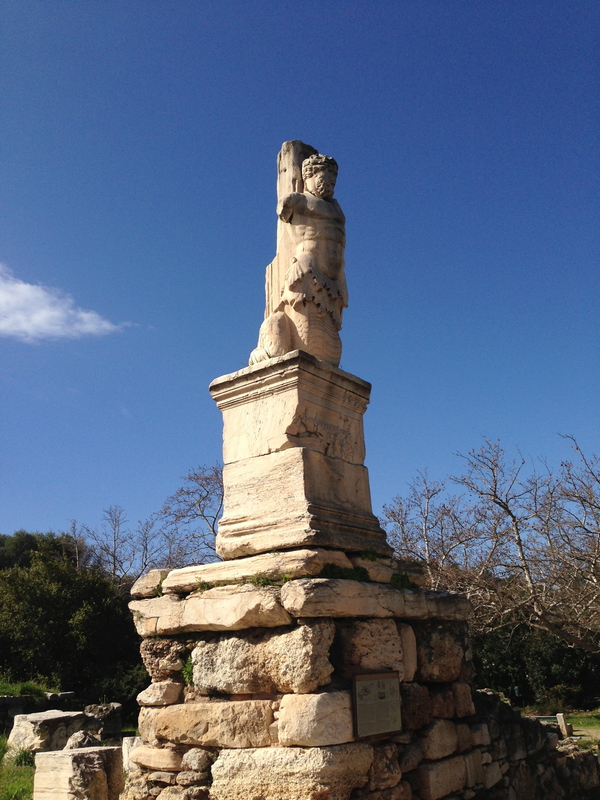 The first thing you notice is the remaining columns from the Temple of Apollo, dating back to the 6th-century BC. We began with the museum, which houses numerous artifacts discovered at the site and gave a flavor for what the city must have been like when Paul arrived from Athens. Two main streets, the city agora, and other temple sites allowed us to wander and explore far more than can initially be observed from the entrance. An adjacent site across the parking lot offers a glimpse of the ancient theater and the Odeon. 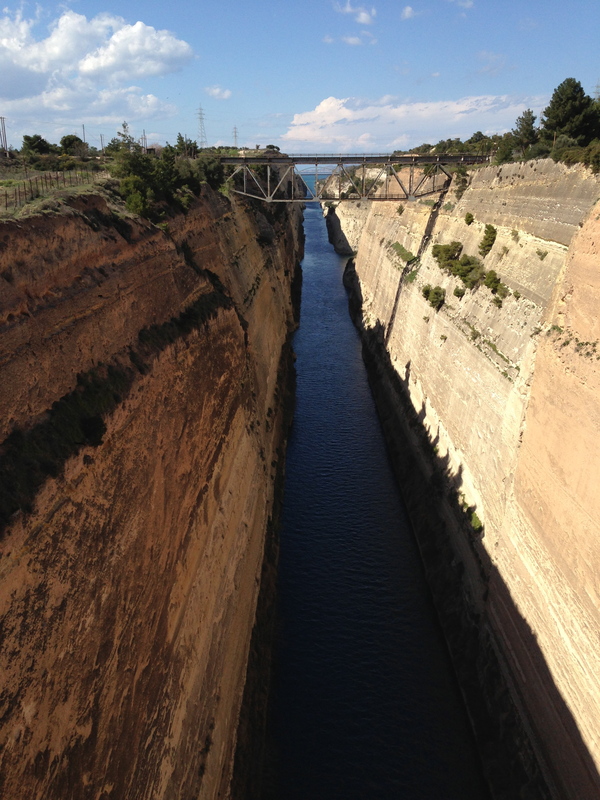 The final stop in Corinth was the Corinth Canal. The canal cuts through rock across the 4-mile strip of land that connects the Gulf of Corinth to the Aegean Sea. It was completed in 1893 but soon became unworkable for modern ships. Yet it still represents an impressive feat of engineering. It is also the location for several ancient attempts to bridge the two bodies of water at the Corinth harbor. Julius Caesar began plans to dig a canal here before his assassination. Caligula revived the plan, but it was not until Nero that the project got underway. The huge effort stalled and eventually became a road that transported smaller vessels across the strip of land. The practice was not simply one that offered temptation if you wandered into the wrong section of town, but it hung over the city like a cloud. All you had to do was look up anywhere in the city and you were reminded of the city’s notoriety. Insight #2 – Temple of Asclepius. 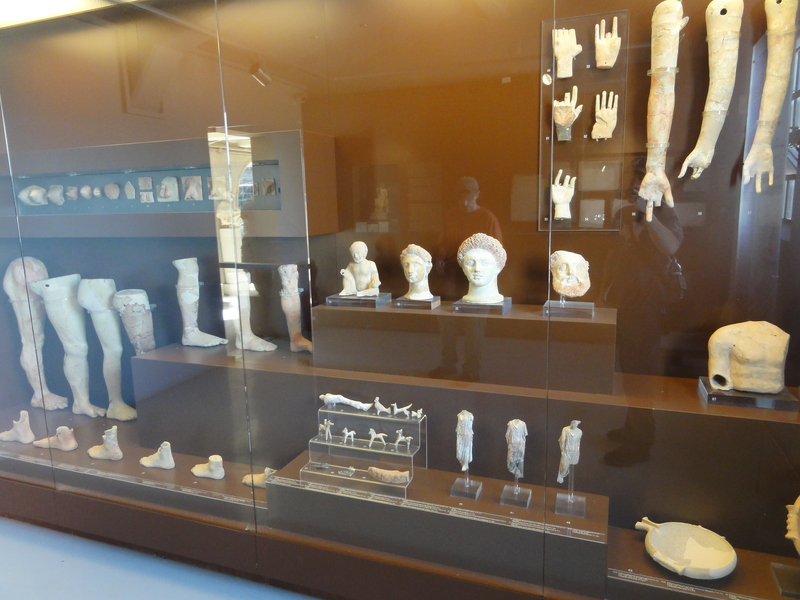 There is a room in the museum at Corinth where you will find replicas of an assortment of body parts. These have been found at the site of a nearby temple to Asclepius. Asclepius was a deified Greek physician, whose symbol of entwined snakes still represents the medical community today. The site included dorms and baths where the sick would come to heal and recover. People would also offer these replicated body parts analogous to their illness as votive offerings for healing. One cannot help but see these and reflect back on Paul’s imagery of the body when writing to the church at Corinth. It is possible that Paul may have seen these votive offerings being sold in the local market to the sick headed up to the Asclepion. While all these body parts look a little creepy, when fully assembled and animated with life, the body become a marvel. Is this what Paul envisioned when he was speaking of the church? Elsewhere Paul encourages believers to offer their whole body – all its parts – as a living sacrifice, perhaps as opposed to votive offerings to Asclepius. Insight #3 – The Erastus Inscription. As you make your way across the parking lot of the site down to the theater grounds, you will notice a sectioned-off area on the stone pavement below. 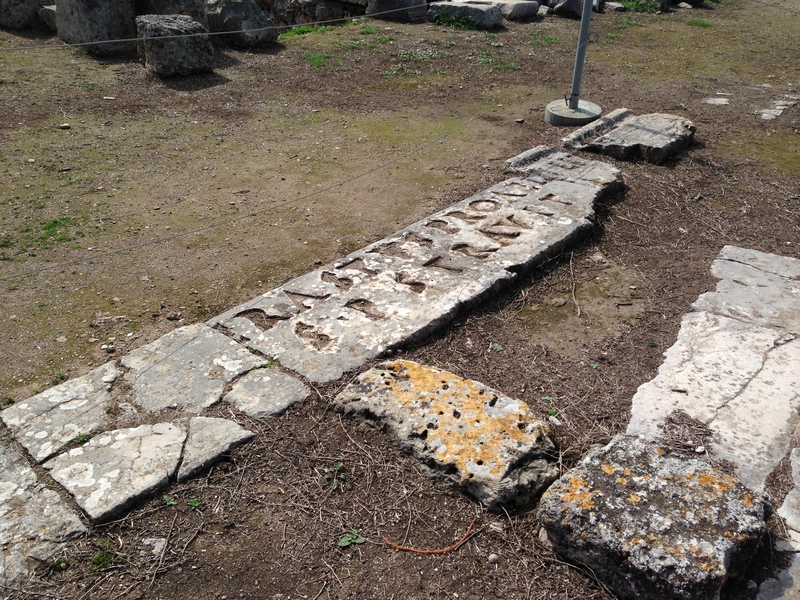 A large inscription on the stone reads, “Erastus, in return for his aedileship, paved this at his own expense.” This is known as the Erastus Inscription and is an important find, as it may refer to the same Erastus mentioned in Romans 16:23, “Erastus, who is the city’s director of public works, and our brother Quartus send you their greetings.” It is one of only a couple inscriptions that can be linked to a reference from Paul and the New Testament. Insight #4 – The Isthmian Games. Corinth was a sports town, as we might say today. Corinth hosted the Isthmian Games, second only to the ancient Olympic Games, for several centuries. 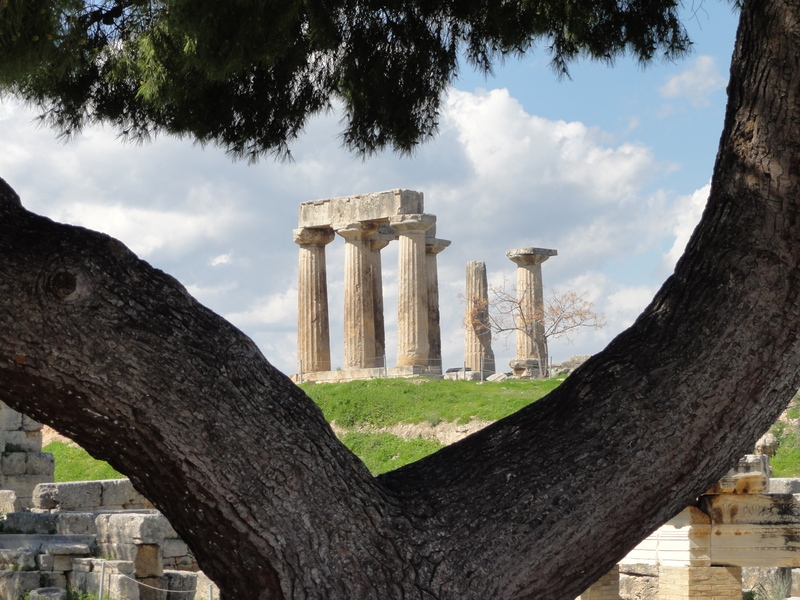 By the time Paul arrived in Corinth, the games already had a 500-year history. There are several tantalizing metaphors along these lines that Paul utilizes in his letters to the Corinthians. We stood on a long road next to the ancient agora that served as a race course lined with box seating for dignitaries. If Paul sold his leather-goods and tents in the agora he would have been familiar with this path. His time in Corinth may have overlapped during one of these games, as they were held every two years. The winner of an event would have received a garland of a type of celery, which quickly wilts after being plucked from the ground. These are only a couple of references Paul mentions throughout his letters to running a race and winning a crown or claiming the prize. Quite fitting for a sports town! The next stop is Ephesus! Last month I was able to travel to Greece and Turkey with my brother. I wanted to share a snapshot (and snapshots!) of each city, as well as some insights gained. For a preview of the trip, read the A Guide to Biblical Sites in Greece and Turkey entry. The first stop on our trip was the city of Athens. Upon dropping our bags in our room, the first thing we did was take an evening stroll around the Acropolis. 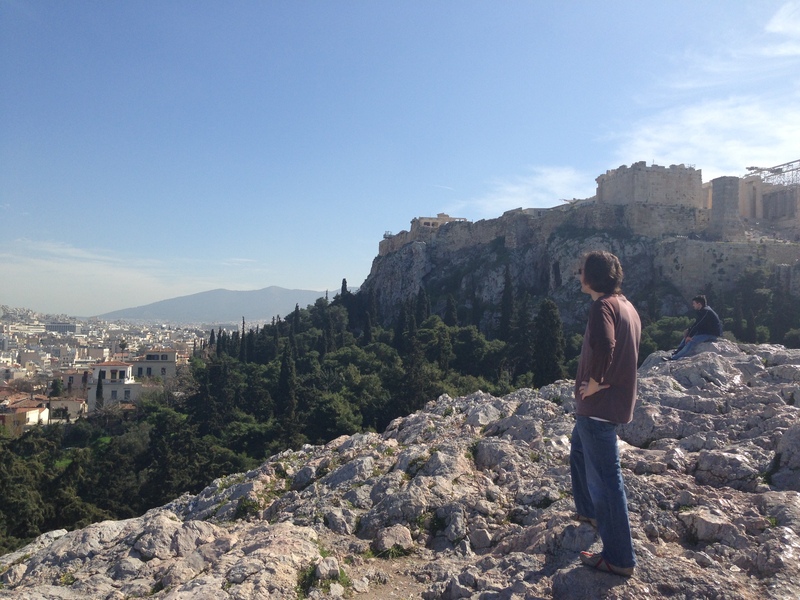 Initially, what strikes you is how elevated the Acropolis is above the rest of the city. It is not difficult to imagine a commoner straining his or her neck looking up the dramatic slopes of the rocky plateau, only imagining what must be taking place there. Surely it was a mystical, awe-inspiring place. 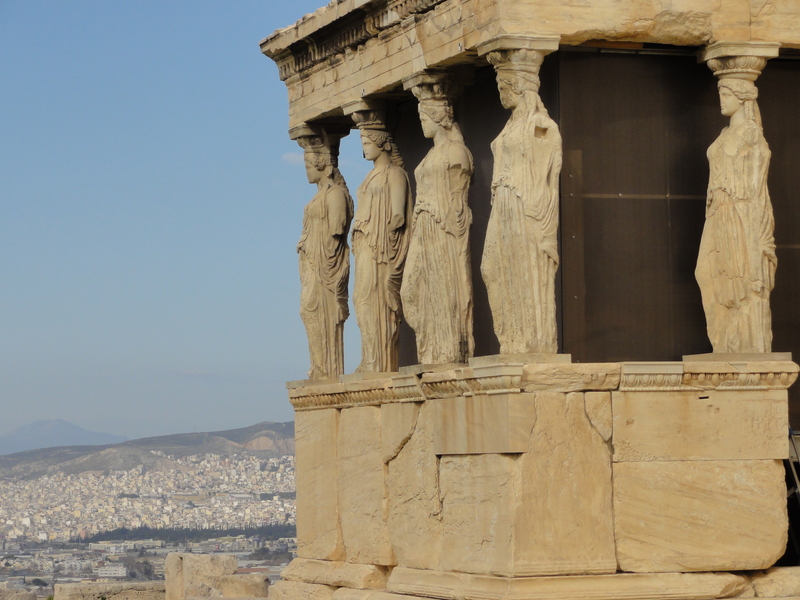 The next morning, we walked through the Acropolis site, taking in the Theater of Dionysus, climbing the grand entrance steps, passing the Temple of Nike, marveling at the impressive sculpted caryatid columns of the Erechtheion, and finally gazing at the Parthenon. The Acropolis gives a wonderful view of the surrounding city, encircled by ocean and large hills. The Acropolis does not disappoint! Later that day, we surveyed the city again from the top of Mount Lycabettus, which is actually higher than the Acropolis. (Of course, the Greeks had a mythic explanation for this.) 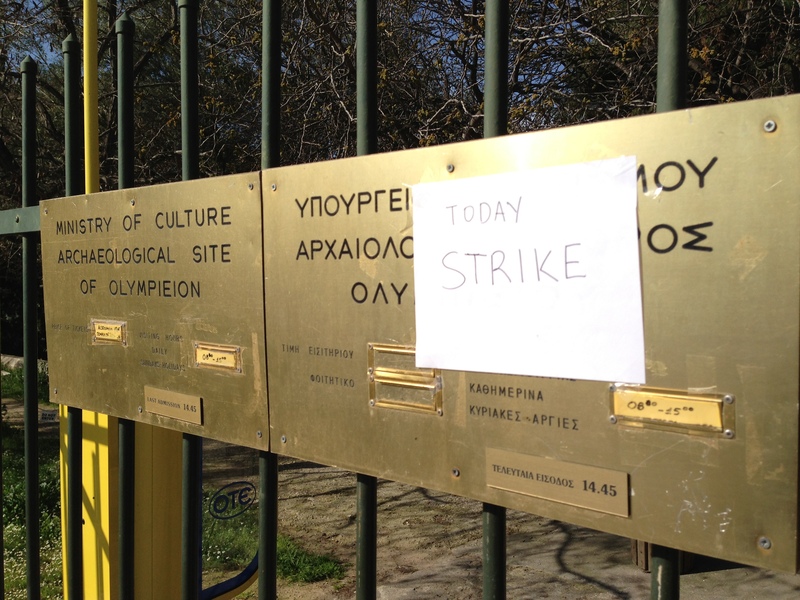 The next day we set out for more sites, but encountered the soon-to-be familiar “On Strike” sign, announcing various historical sites closed for the day – frustrating for a visitor with limited time in the city! We did manage to discover Mars Hill and the Areopagus (literally standing on top of it, trying to figure out exactly where it was). The final day before we left for the airport, we did a quick pass through the Ancient Agora and took one last look at the Acropolis. Besides the old stuff, one thing you quickly notice is the many stray dogs that roam the city. Most however, seem well-fed and even have de-facto owners who care for them. In the National Gardens we observed a couple police officers call for all the dogs – about 8 or 10 responded – and led them out of the park at closing. You will also notice graffiti everywhere. We even ran across a shop that specialized in all your graffiti needs – paints, stencils, as well as tips and tricks! I read some speculation that given the economic climate of Greece, graffiti may be the cheapest form of advertising your business, though I didn’t gather that from what we saw. There is little doubt that the economic climate has people frustrated, both at the politicians and at those who think the problem should be solved as long as someone else foots the bill. I would look forward to visiting Athens again when it has its economic house in order. 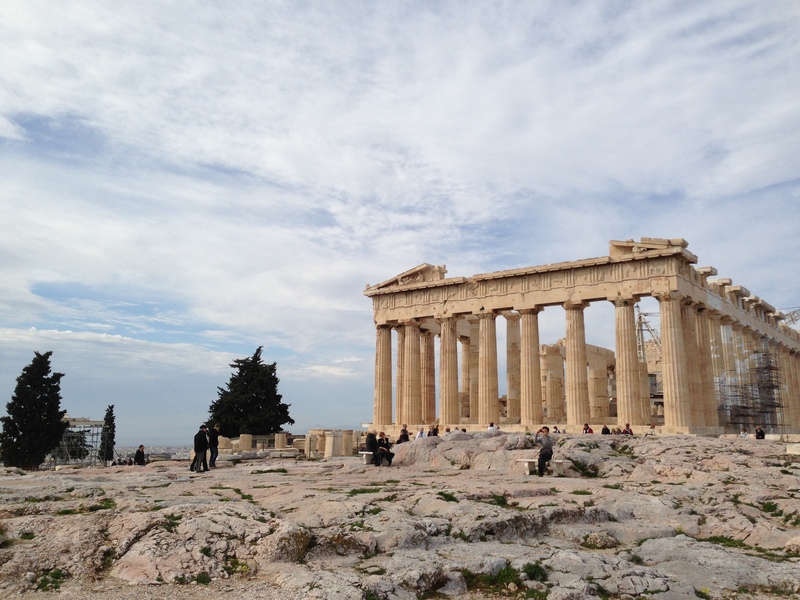 Insight #1 – Athens isn’t nearly as important to the Apostle Paul as other cities. Visiting Athens versus Corinth today, we might naturally assume that Athens was a key city in reaching the Gentiles. As I mentioned in a previous post, for all its influence Athens does not stand out in the New Testament. Paul quickly moves on to Corinth. But his sermon delivered on Mars Hill is recorded in Acts 17, thus giving Athens a lot of air time. I imagine one reason that Athens is not predominant in Paul’s thinking can be found in Acts 17: “All the Athenians and the foreigners who lived there spent their time doing nothing but talking about and listening to the latest ideas.” The picture we get is that Paul could have had many great discussions with the lovers of philosophy in Athens, but would have seen very little transformation take place. A few did accept Paul’s message, but Athens isn’t mentioned again. Insight #3 – Greek mythology reveals much about how the ancients understood the world beyond. I’ll comment more on this in a future post as I process it more, but one of the things I wanted to do in preparation for this trip was to better understand Greek mythology. And although I enjoyed it, I wasn’t sure what to do with it. I was going to write a post on one of the books I read, but honestly didn’t know what to say. But having immersed myself firsthand in the subject matter for a couple of weeks – walking through it, touching it, breathing it – I have come to appreciate it much more. It circles back to Paul’s own observation: “I see that in every way you are very religious.” And I have concluded that my own life could use more of the mythic – that attempt to understand the spiritual world and connect to the larger story – not less! Check back for the rest of the sites on my journey! Corinth is next. A better title for this might be: Where I’m Going! 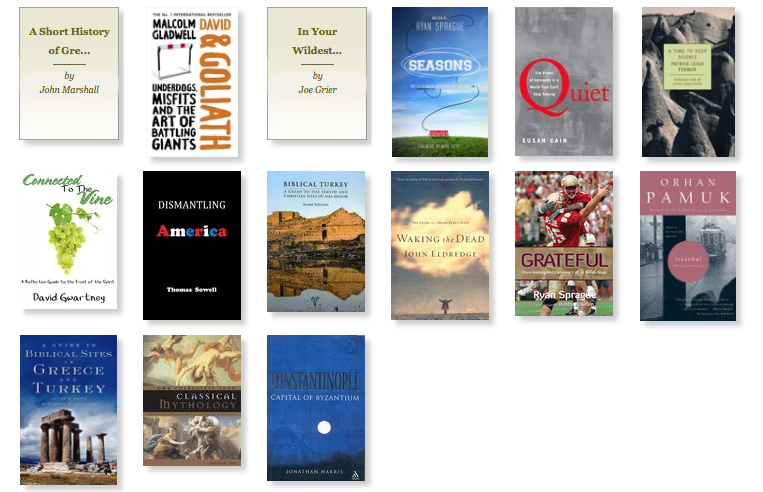 I’m using the format of sharing what I have been reading to write about an upcoming trip I am taking to Greece and Turkey. However, one of the reasons for such a trip is captured in this book. My journey will take me to some of the most important classical and biblical sites around the Mediterranean. The book itself is a great resource for such a trip. Any ancient site mentioned in the New Testament located in modern-day Greece or Turkey is summarized in this guide. A brief history is given for each site, followed by the Biblical significance of the site, as well as an orientation to a site visit. As the book itself points out, “Nearly two-thirds of the New Testament, including all the letters of Paul, most of Acts, and the book of Revelation, are set in either Turkey or Greece.” My intention was to only peruse the sites I would be visiting, but I ended up reading the entire book. Here is a brief synopsis of the places I will be experiencing on my trip. Athens. Next to Rome, no city has made as many contributions to art, philosophy, and political theory as Athens. The city is the birthplace of Democracy and was the underlying cultural influence for much of the Roman Empire. Surprisingly, for all its influence, the city itself does not stand out in the New Testament. Acts 17 records a sermon that the Apostle Paul delivered in Athens at the Areopagus, or Mars Hill. After Paul left the city, nothing more is said about Athens and other cities become the focus of Paul’s journeys. Yet, like its influence on Rome, the cultural impact of Athens reverberates throughout the New Testament. Corinth. 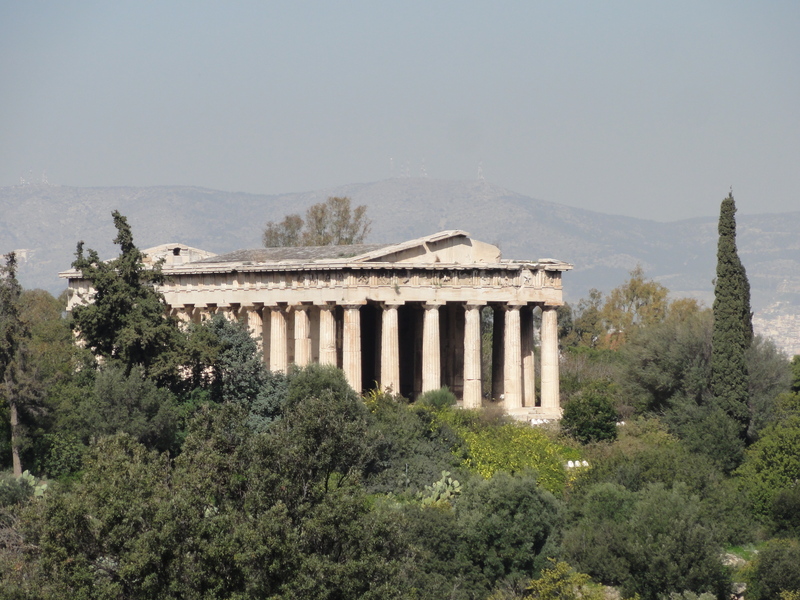 Much more prominent in Paul’s writings is the city of Corinth, which is only a couple of hour away from Athens. The authors Fant and Reddish note that while Corinth benefited much from trade and commerce in the ancient world, it also found itself frequently dragged into the rivalry between Athens and Sparta. In the New Testament, Paul spent eighteen months in the city and visited it on at least three separate occasions. Two extant letters were written by Paul to the church he established at Corinth and they contain numerous references to the ancient site. Ephesus. 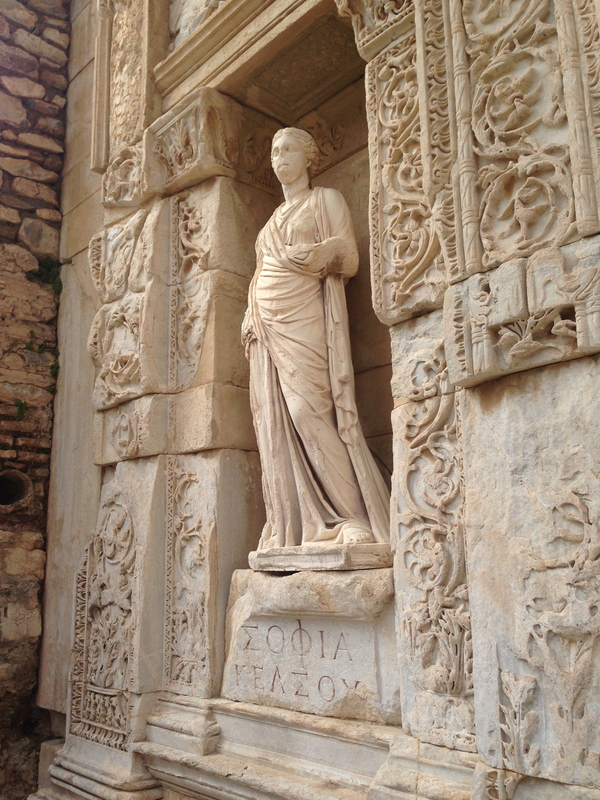 The site of Ephesus is one of the best preserved archaeological sites around. It was home to one of the ancient Wonders of the World, the Temple of Artemis, though there is little that remains of the temple. Ephesus served as a home base for much of Paul’s missionary endeavors in Asia Minor, spending about three years there. The book of Ephesians is a letter from Paul to the church he established there. One of my current writing projects explores the connections between the book of Ephesians and the ancient city of Ephesus. Cappadocia. The region of Cappadocia in central Turkey is not mentioned prominently in the New Testament, though Paul does pass through the region on a couple of occasions on his way to Asia Minor. Cappadocia is better known for its other-wordly landscape and does figure prominently in the history of the early church. Many early churches can be found throughout the region. Istanbul. Another city not covered in this particular book is the city of Istanbul, better known historically as Byzantium or Constantinople. While not mentioned in the New Testament, Constantinople would take center stage in the Christian world when the Emperor Constantine moved the capital of the Roman Empire from Rome to the site of this modern city that serves as the place where Europe and Asia meet. It is a large modern city that is littered with Byzantine and Ottoman sites. I’m not sure if I will be able to blog during my trip, but at the very least I will be exploring these sites and sharing pictures upon my return in a couple of weeks.